Developer: Electronic Arts Inc. (EA), Origin Systems Inc.
"Ultima Online (UO) is a graphical massively multiplayer online role-playing game (MMORPG), released on September 25, 1997, by Origin Systems. 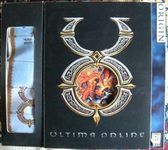 Ultima Online continued the tradition of previous Ultima games in many ways, but due to advancing technology and the simple fact that it was Origin's first persistent online game, there were many new game mechanics as well. Partially designed as a social and economic experiment, the game had to account for the widespread player interaction as well as deal with the long history of players feeling as if they were the center of attention, as had been the case in single-player games. New to both the developers and the players, a lot that was planned never happened, and a lot that was unexpected did, and many new game mechanics were put in place to compensate. Source: Wikipedia, "Ultima_Online," available under the CC-BY-SA License.